With Shinji Okazaki’s scrambled goal against Liverpool last weekend, it highlighted a potentially serious problem for Liverpool – their defending from corners. Last season Liverpool conceded 7 goals from 133 corners faced, resulting in a 5.26% corner conceded percentage – the highest in the Premier League. Things haven’t improved this season either, with an incredible 3 goals conceded 21 corners (14.29%) – this high percentage (6.49% for 16/17 and 17/18 combined so far) – this is costing Liverpool points, so below I’ll examine how Liverpool set-up from corners, and see whether it’s luck or something wrong in their defensive set-up that’s costing them goals. On paper this is actually a relatively solid defensive set-up, I like the wall of players zonally marking the danger area at the near post and on the edge of the 6-yard box along with a mix of man-marking Hull’s danger-men from set-pieces. Georginio Wijnaldum (#5) gets the initial header away, but it’s not strong enough and David Meyler is on hand to smash the second ball home. The only suggestion I’d have for improving here is removing a couple of players from the wall marking the near side (5 is probably too many) and moving them into the central area in front of the goalkeeper – the main danger zone – perhaps either Jordan Henderson (#14), Sadio Mane (#19) or Philipe Coutinho (#10) who are free and not doing much defensively would stand between Roberto Firmino (#11) or Ragnar Klavan (#17) to crowd that danger zone. Again a solid looking defensive set-up, with both the wall of players by the near post and along the 6-yard box line. Jordan Henderson (#14) and Wijnaldum (#5) are the only players man marking, marking Leroy Fer and Jack Cork. The ball is floated to the back post where the header reaches Mike van der Hoorn who manages to scoop the ball into the path of Fer who bundles the ball into the net. A relatively good defensive set-up, albeit slightly dangerous leaving Henderson (#14) with 2 men to mark considering both Coutinho (#10) and Mane (#19) are pretty much completely free and it’s from this area where the goal comes from. Liverpool could count themselves unlucky as Can doesn’t connect cleanly with the ball leaving McAuley to slot home from close range. Only a four-man wall marking zonally this time, with Wijnaldum, put on the player next to the goalkeeper. Again Coutinho (#10) is in no man’s land despite there being players free and again Liverpool are slow to react to the 2nd ball as it lands next to Wijnaldum and Llorente taps home from a couple of yards out. A slight change to the usual defensive set-up, the wall of players zonally marking the 6-yard area are shifted closer to the corner takers, leaving a large gap towards the back post – whilst crowding the area most probable for the ball to land. The ball does not land in this area but instead goes towards the penalty spot – crucially the players marking zonally all rush outwards towards the ball, meaning that when a Hull head connects with the ball, it’s an easy finish for the Hull player as there’s simply nobody there to stop him. If the players had actually marked zonally – the chance probably wouldn’t have happened. Keep an eye on the Ashley Williams (Everton #5) in this clip. Both Mane and Clyne are marking the edge of the box, leaving Can (#23) with the tough job of man-marking both Williams and Jagielka (#6). Obviously, this is impossible especially as they split when they did – and it’s easy for Williams to simply walk right into the danger area and again, the defence is too slow once Williams shot is blocked. Again we see the wall along the 6-yard area, with 3 Liverpool players this time marking the 2 Liverpool players nearest the penalty spot. The corner is played in and the ball somehow finds itself into the danger area where Benteke has evaded both Can and Wijnaldum (both who remain stationary!) to head home from 6 yards out. Poor marking from Can and Wijnaldum partly at fault, but the players marking that area zonally also failed to deal with the danger and at fault for ball watching. A bit of a chaotic looking set-up here. The danger area right in front of the goalkeeper is too under-manned, with Salah (#11) and Alexander-Arnold (#66) also doing very little in his current position. Also notice that the entirety of the Liverpool defence who are marking zonally are watching the flight of the ball – not once looking at any potential runs being made by the Watford plays, meaning it’s easy for Okaka to nip in front of Firmino (#9) and get the header away. Another scrappy goal conceded from poor follow-up play and reaction time (with a slight hint of goalkeeper error and potential foul thrown in for good mix). The defensive set-up, however, I do like – with a nice shape restricting the Watford runs – although again Milner (#) and Mane (#19) are contributing little in their current positions and would be better off in and around the danger area. A very flukey goal to concede, although I’m definitely not sure what Joe Gomez (#12) is doing not jumping (although it does look like there’s possibly a foul on him), but would be solved (like much of the other goals) by putting a player on the post – more on this below. Interestingly Liverpool have only conceded once from the first phase of a corner (aka a direct header) over the 2016-2018 seasons so far which is certainly a good sign, however, the fact they’ve conceded so many immediately after the corner has taken means something is definitely wrong, and they aren’t simply unlucky. So what could they do to prevent this? Firstly, if you look at the pictures of the lineups above, there’s one constant (apart from the Hull goal which was due to atrocious zonal marking) – there’s always at least one, and often 2 Liverpool players on the edge of the box. This is done for 2 reasons, the first is to stop any passes along the floor to any players lurking on the edge of the box, and secondly to pose a counter-attacking threat (it’s no coincidence that the players often put there are Mane and Salah). 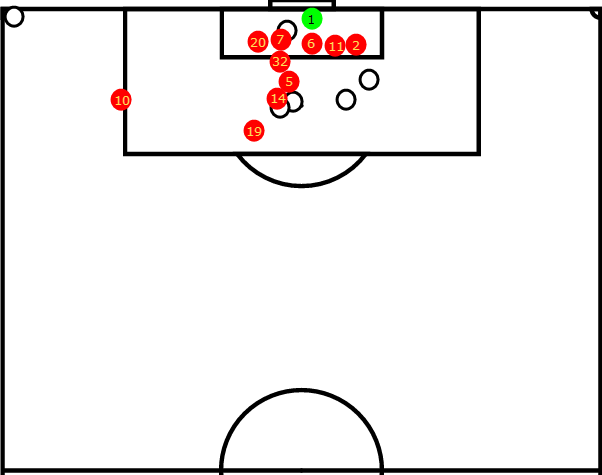 When you’re leaking goals from corners at Liverpool’s rate though, the cons far outweigh the pros of having this, and I would definitely move at least one of them into a central area closer to the 6-yard box or perhaps…onto a post. I’m not particularly a fan of having players directly next to the post for corners as I believe you want to stop the first header occurring, rather than risking it happening and instead stopping the resulting shot – but what happens when you ARE stopping the initial header, but the shot still happens? 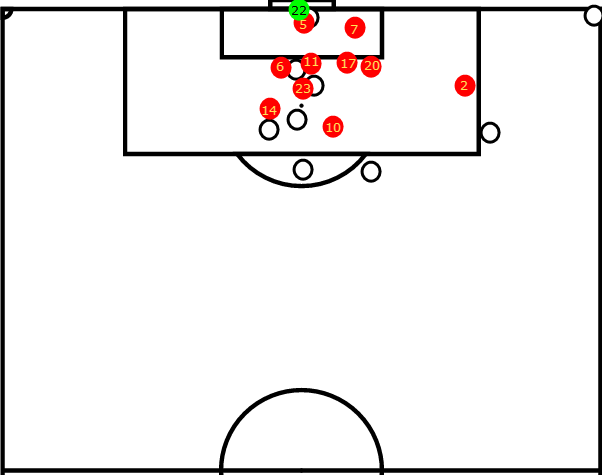 Having a player on each post facing outwards towards the opposition goal should certainly help conceding goals around the 6-yard area like a majority of the goals above have been. The marking in general (both zonal and man-marking) also needs to be improved, players should not leave their zone unless the threat has been adequately cleared and likewise players that are man-marking should obviously always follow their man until the the threat has disappeared. This is something Liverpool need to fix and soon – if they’d achieved the average of 3% (that is on average roughly 3% of corners are scored) last season they would’ve conceded 4 goals from corners, instead of the 7 they did, which could have potentially cost them 3rd place (as they finished 2 points behind Man City). This season that could be the difference between Champions League and Europa, which again shows how much set-pieces are undervalued in the modern game.